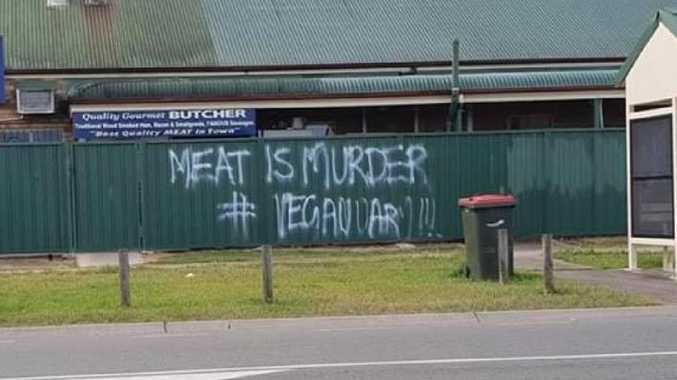 Vigilante vegans vandal The Bellmere Butcher with graffiti. A PRO-vegan stunt has caused major backlash in a small Queensland community after a local butcher's shop was vandalised in broad daylight. 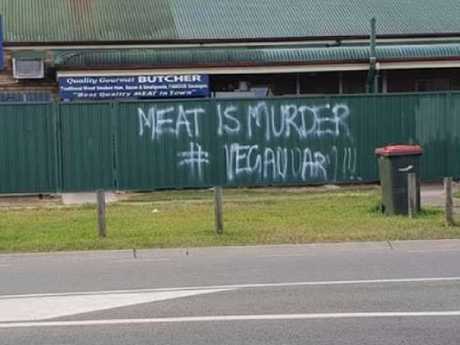 Residents in Bellmere, north of Brisbane, were left outraged when Bellmere Butcher's fence was spray-painted with the words "meat is murder #Veganuary" on December 28. The phrase "veganuary" refers to a campaign that is aiming to get people to try a vegan diet for the month of January. The campaign hopes to encourage others to adopt a more plant-based diet but the attack on the butcher has done nothing to help the vegan agenda for the people of Bellmere. The attack took place while the owner of the shop was away. Moreton Bay Regional Council councillor Adrian Raedel slammed the stunt on Facebook, asking for help from the community in identifying the vandals. "This is not ok," Mr Raedel wrote next to pictures of the message. "If you want to get your message out there then rent a shop, put up legitimate signage and I'll defend your right to say it! "BUT if you destroy somebody else's property and affect our local businesses through vandalism or graffiti and degrade our streetscape - then that's NOT OK!" 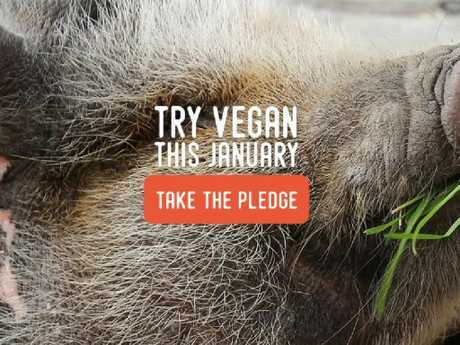 Veganuary is a campaign aiming to encourage people to change to a plant based diet for a month. Social media users agreed with the councillor's sentiment, with many saying stunts like this do nothing but make people reject the idea of veganism even more. "Wtf! I'm a vegetarian yet I can't see what good this does anyone or anything?! This is just vandalism," one person said. Another commented: "In response to this criminal act and ideologically inspired attack on a legitimate business I'm going by make a concerted effort to eat MORE meat, and I'll take a drive and buy it from this butcher." Some users believed the shop was targeted because of antagonistic signs that had previously been placed out the front of the store. Some people thought the shop may have been targeted because of signs that had been put out the front of the store. 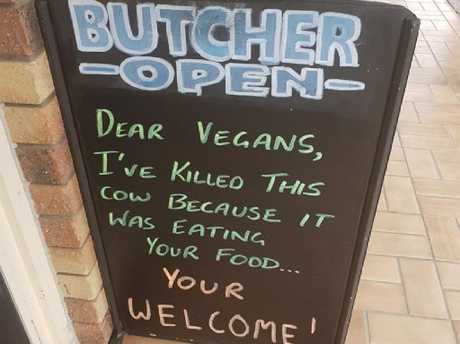 One sign read: "Dear vegans, I've killed this cow because it was eating your food … You're welcome." Owner of the butcher, Josh long, told the Courier Mail that he was worried the shop would get a lot of negative attention as a result of the vandalism. "We didn't get a whole lot of negative feedback, most people were supporting us. In the end we got publicity and it didn't help their cause," he said. "I understand what they're saying, but they should have just come talk to us and we could have explained we use RSPCA approved meat. "People have opinions and they're entitled to it, but it's still vandalism whether it's activism or not." premium_icon Why is a vegan sausage roll so controversial?